As some of you maybe noticed, I get a lot of my ideas and inspiration from Real Simple Magazine. It is one of my favorite magazine, website, newsletter – everything! Well yesterday after a long night of hanging with friends, my best friend and I decided it was a perfect lazy Sunday to dye our hair and look at wedding magazines. Granted, she is a lot closer than I am to getting married (aka – she is dating someone), but nonetheless, neither of us has a ring on our finger. We were going to go the cheap route, but how could we pass up Real Simple Wedding!? Seriously, this has everything you could ever want when planning a wedding. 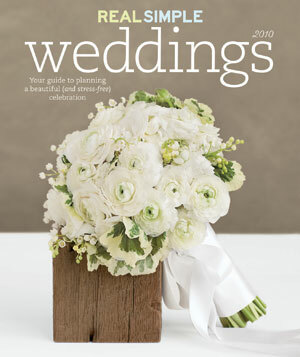 It is really more like a workbook than a magazine, but they still have inspiring wedding ideas and tons of photos. One of my favorite is the color coordinating section. If you prefer green, then it will give you several color combinations that work. Ok, you think this can’t get any better, well just tear out the postcard insert inside the magazine, send it in, and you get ONE FULL YEAR OF FREE REAL SIMPLE! Considering this is one of the more expensive magazines out there, this is a great deal! Whether you are getting married or not, you can’t pass up a free subscription.